Fried cucumbers are quite good, I am telling you. This is something good about Chinese food. Reference Book: ANA in-flight magazine, August issue, 1997. * The details of this recipe are uncertain because I didn't bring one home. Whenever we buy cucumbers, we make Kyuri to Myoga to Shiso no Shiomomi in our family. When they are cheap, we buy a lot and we use them to make pickles or a vinegary dish, but normally, we still cannot use them all. I knew they stir- fried cucumbers in Chinese recipes and I had tried it before, but I couldn't get the right crunchiness like professional cooks do. When I was on an ANA flight during my business trip, I happened to find a recipe with cucumbers in their in-flight magazine. I remember it was Chef, Shu Tomitoku's recipe. In this recipe, I learned that the key to success for this recipe is in the special preparation of cucumbers. Since I learned this, I get satisfactory results almost all of the time. * You could adjust the quantity of the ingredients as you like. Red and green peppers make this dish more eye catching. It's important to remove seeds from the cucumbers before you cut them into chunks. It's also important to boil (Yu doshi) or fry in oil (Abura doshi) vegetables before stir-fry all the ingredients. Then, all you have to worry about now, is to follow the Golden Rule in Chinese cooking: Cook Quickly over High Heat. Boil water in a wok. While the water is boiling, prepare vegetables. Cut peppers into, what they call, Sankaku-giri, a triangular shape. Try to shape a base of a triangle with each cut like I show in the picture. Cut Naga Negi (Japanese leek) into 3 cm length. Quarter cucumbers so they look like long sticks. Cut off the seeds. (It's important to remove the seedy part from cucumbers or the dish will be too soggy.) Then, cut them into 3 - 4 cm-big Ran-giri by cutting them diagonally once and roll the cucumber stick with your left hand then cut diagonally again to the same degree. Continue this process. Add 1 tablespoon salt into boiling water and add all the vegetables. Don't cook until they become soft. * When making Chinese vegetable dishes, this process will give you the best result. It's worth trying. You could also fry them in oil over slow heat (Abura Doshi) to get a professional like finish. 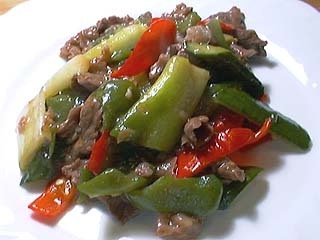 While vegetables are boiling, cut beef into bite size pieces and finely chop ginger and garlic. Drain vegetables, wipe off water on the wok with absorbent paper. Add sesame oil in the wok and fry ginger and garlic over slow heat until they are brown and fragrant. Add beef and fry over high heat until 80 to 90 percent of the pink color disappears. Add boiled vegetables. * The recipe in the in-flight magazine said to boil beef as well as vegetables but I think it will be too much trouble and not really necessary. Add oyster sauce, Sake and soy sauce. Don't use too much oyster sauce or the dish will be too rich. Stir in Mizudoki Katakuriko and mix well.